The Kentucky Derby is now seven weeks away. There hasn’t been a horse that has blown away the field during the Derby qualification. This means Kentucky Derby 2018 odds for online betting will likely continue to change until we get to the race. There were some betting odds updates with another new name moving up the list. This was thanks to an impressive performance over the weekend. Bolt d’Oro remains the favorite to win Kentucky Derby 2018 odds after his win at the San Felipe Stakes last weekend. The win was Bolt d’Oro’s fourth in fifth starts, and unless he loses another race before the Kentucky Derby, he should be expected to drop from the top spot. Justify’s win at Santa Anita Park’s fifth race last week gave him a big boost, especially after the way he dominated the race. Even though he didn’t race this past weekend and hasn’t faced a lot of the top contenders in the Derby, he moved from fourth to second this week. McKinzie finished second to Bolt d’Oro at the San Felipe Stakes last week. 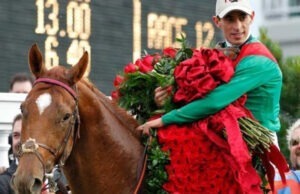 And despite the controversial ending to the race, he remains one of the top contenders to win the Derby. Even though he is considered one of the best horses in the field this year, he was leapfrogged by an idle Justify in terms of Kentucky Derby online betting. Good Magic was once the favorite to win the Kentucky Derby, but his third place finish at the Fountain of Youth Stakes dropped him to fifth place last week. This week, he moved up one spot, but don’t be surprised to see him drop again after Magnum Moon’s impressive performance. His next race is the Blue Grass Stakes next month. His win at the Rebel Stakes this past weekend moved him to the top contenders list, and if he performs well at the Arkansas Derby next month, expect his odds to win the Kentucky Derby to get better.